I've recently been using REN Micro Polish Cleanser and those of you who have watched my newly launched YouTube channel (click here to view) will know that it's one of my favourite products so far this year. 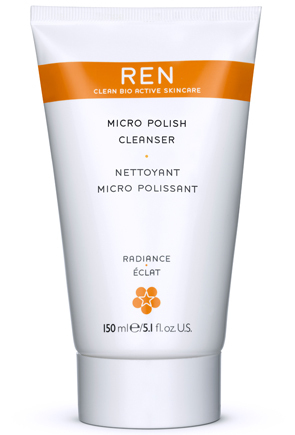 REN Micro Polish Cleanser is a facial exfoliator which combines physical scrubbing particles such as crushed Amber Microbeads with Glycolic Acid exfoliants from fruit such as pineapple extract. It's a minor quibble but I do feel that the name is quite misleading. This should not be used as a daily cleanser but 2-3 times per week (I've been using it twice a week for approx 6 weeks so far and following with the REN Radiance Perfecting Serum). I liked the functional tube presentation which looks sleek with the signature Ren "clean" & minimal branding. The tube itself feels very lightweight and as though you're not getting the full amount of product but this is merely due to the texture of the product inside. I've found that the product separates a lot in the tube between uses so recommend shaking the tube vigorously before squeezing the product out. 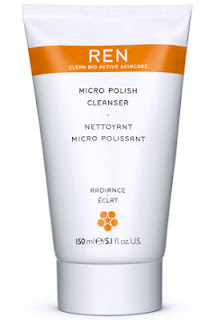 REN Micro Polish Cleanser has an unusual mousse-like formula with scrub particles. It feels as though a little goes a long way but having said that, I feel as though I'm getting through the tube rather quickly. The formula, combined with the tempting fruity fragrance, make this a joy to use. It feels lightweight to apply onto the skin and although it offers a very effective exfoliation due to the combined effects of the scrub particles and the Glycolic Acid, it doesn't feel scratchy or overly abrasive. The double action exfoliants mean that it's more powerful than you might suspect and as a result, those with very sensitive skin might find that this isn't suitable. This leaves my skin feeling deep cleaned (I'm looking forward to using it in the summer when I apply heavier SPFs) and super soft & smooth. I have some hyperpigmentation on my face which looks slightly diminished and I feel that any spots I've had have healed more quickly than usual. At £20 for 150ml, REN Micro Polish Cleanser doesn't come cheap but I can't recommend it highly enough. I've had problems with pigmentation, too, and it's good to see this works on that. I've been using Glymed Plus Sal-X exfoliator, from my esthetician back home, and I'm running out. What's wrong with using this Ren product every day? Is it drying?